As the 60 year reunion of Darrell Royal’s 1957 recruiting class approaches, my thoughts return to the special moments of Dad's life as a Longhorn. Although he passed on April 2, 2005, and he is not able to attend this momentous reunion, his spirit is present in DKR-Memorial Stadium, in Moore Hill Hall, on the practice field, and in my life. The time he spent playing football at the University of Texas shaped him as a professional, as a father and as a man. Under Darrell Royal and his coaching staff’s tutelage, the lessons he learned in those four years of Texas football, became the lessons of my childhood. I became his standard bearer. I was born in 1969. This is the year that the Longhorns mastered the Wishbone offense, a slippery, hot, and hard Astroturf, the Arkansas Razorbacks, and the Notre Dame fighting Irish to win the national championship in the 100th year of College Football. It was a great time to be born in Texas!!! Between the championship season and my birth in 1969 developed a special bond between the two of us that has lasted a lifetime. 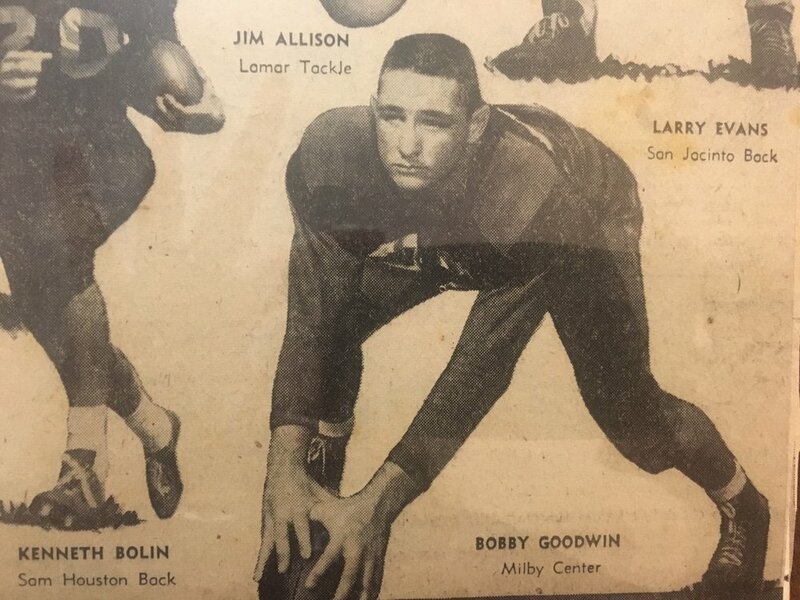 In 1956 Bobby Goodwin was one of the top football recruits in the Southwest. He went to Milby High School in Houston and received many honors that resulted in scholarship offers from TCU, Baylor, A& M ( Bear Bryant was the coach), University of Houston, West Point, O.U. , Tulsa, and THE University of Texas. 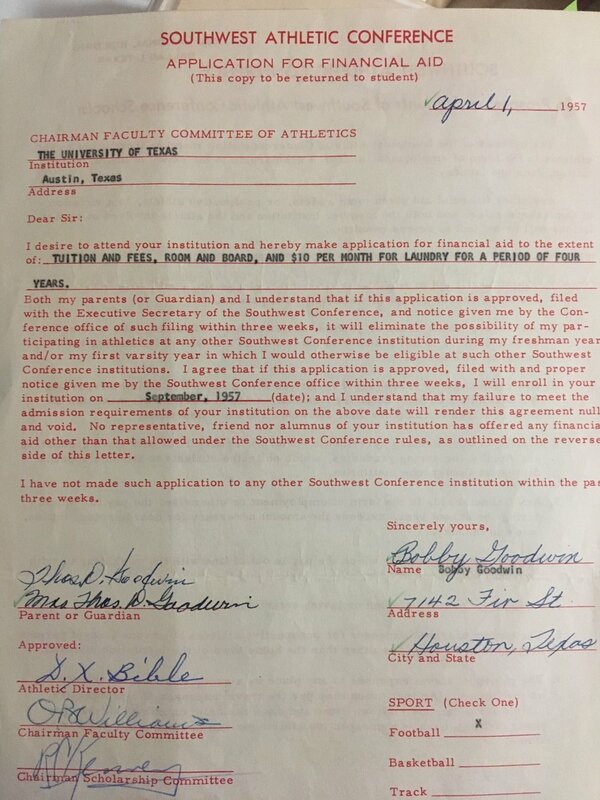 My dad made the risky choice of joining Coach Darrell Royal’s first recruiting class in 1957, but history proves that Bobby Goodwin made the right decision. I still have the original scholarship he signed on April 1, 1957. It reads, "Tuition and Fees, Room and Board, and $10.00 a month for laundry for a period of four years." Years later he would tell me without reservations that attending Texas were the best years of his life. Jokingly, he would say that parenthood was fine, but his days at UT were better. He said that teammates such as Dan Petty and JB Padgett became like brothers. The bond was so strong that JB named his first son after my dad. Coach Royal was not the player's friend. His role was to coach, and the the teammates role was to play football. While Dad was scared to death of Coach, dad spent his whole college career striving to make Coach Royal proud of him. The Austin American Statesman was enamored with the size of the players on the freshman team. Bill Young was 6'-7, 250, Don Talbert 6’5 and 205, Gerald Crutsinger 6’4 205, and Butch Goodman was (6’4, 200.) My Dad was 6 feet 205 pounds, but he was quick and fast, and a good hitter. In the 50’s team members had to excel on both offense and defense to play for the Longhorns. There was no platoon system. Fortunately for Dad, Coach Royal realized early that Bobby Goodwin was not only a great offensive lineman but also a great defensive player. Dad loved to hit people on defense. This was important because Coach Royal focused more on defense than offense in his early years. Royal used to say, if the game ended zero to zero, at least that meant that you didn’t lose. 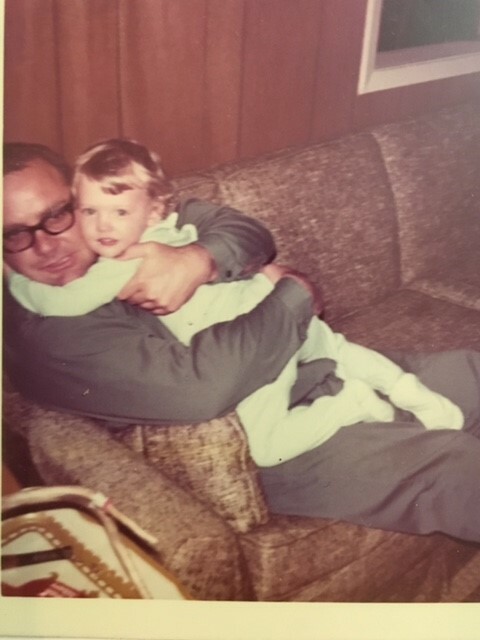 For the first three years of my life, I had my dad all to myself. (My brother Hunter wasn’t born until three years later.) I have very fond memories of those years and watching the Longhorn games together. Other Longhorn fans would come over; the games were an event, more like a party, and my mom made snacks. But the memory that stands out the most is me tucked in the crook of my dad’s arm watching the television. I quickly learned that the Longhorns made my dad crazy. He’d scream and yell and curse. And at the age of one, of course, all that yelling scared me to death, so I’d start crying, and people would have to coach me. They’d say, “He’s not yelling at you. He’s yelling at the football game.” I must have gotten used to it, because I kept watching the games with him, and he kept yelling. Early on I realized football was a man’s game, so I found solidarity with the twirlers. I thought they were so beautiful and they had such appreciable skills. I mimicked the twirlers. I’d break away from Dad’s arm and twirl a plastic corn cob occasionally. That got me some of attention from our guests. While I may have identified with the Twirlers, football was still central to my childhood. It was the construct of our lives. It was how I socialized. Texas Longhorn football gave my dad a sense of purpose and mission in life. He was a smart man, a lawyer; he had this active, keen mind, and he used a large part of his brain to store and retrieve Longhorn football stats. He could rattle off completed passes, yards rushing, time of possession, and conversions on third down… to anyone who was willing to listen to him. He kept a calendar like other people keep diaries. In his calendar he recorded all his workouts. And, on occasion, he still ran pass patterns and pass defense, ten years after he’d finished playing the game. In some ways it was hard being a girl surrounded by all that football. I never got to play the game or understand the deep bonds shared between teammates, but I did leverage my front row seat into Texas football history to start my own life. In 1988 the values he taught me that transcend sports and gender -resolve, perseverance, and work ethic- resulted in a full athletic scholarship to USC. This picture reflects a very special moment in my life. On this day in 1989 it was my father's turn to have a front row seat as I entered USC sports history as an All American in Cross Country. Even though my dad passed away in 2005, he and I are still bonded. In good times and bad times our spirits continue to connect and during those moments I draw strength from him. Bobby Goodwins accomplishments are a reminder to all Longhorns that In sports and far beyond, his contributions to Longhorn heritage shape the present and empower the future. Amy has her own site that features original content. Here is her site. And here are some of her articles.